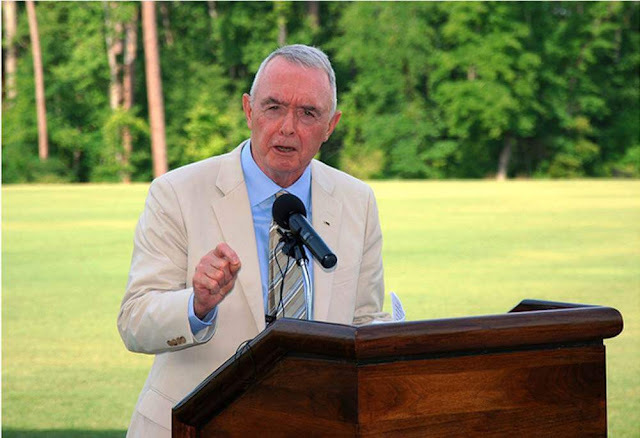 Wednesday, October 10, 2018, General Barry McCaffrey will speak to a joint meeting of the Shoreline and Lake Forest Park Rotaries. Shoreline Community College, Pagoda Union Building, 16101 Greenwood Ave N.
The meeting starts at 7:00am with breakfast and camaraderie; the formal program starts at 7:30am. General McCaffrey is president of his own consulting firm, BR McCaffrey Associates LLC. He is a national security and terrorism analyst for NBC News. He served in the United States Army for 32 years and retired as a four-star General. At retirement, he was the most highly decorated serving General, having been awarded three Purple Heart medals, two Distinguished Service Crosses (the nation’s second highest award for valor) and two Silver Stars for valor. Even as a young man, he was focused on a vocation of lifelong service to his country. He attended Phillips Academy in Andover, Massachusetts, and graduated from West Point with a Bachelor of Science degree. He earned a Master’s degree in American Government from American University and attended the Harvard University National Security Program as well as the Business School Executive Education Program. For five years after leaving the military, General McCaffrey served as the Director of the White House Office of National Drug Control Policy. He was the Bradley Distinguished Professor of International Security Studies at West Point from 2001-2005, and an adjunct professor of that department from 2006-2010. In May 2010 he was honored as a Distinguished Graduate by the West Point Association of Graduates at the United States Military Academy. In 2007 he was inducted into the US Army Ranger Hall of Fame at the US Army Infantry Center, Ft. Benning, GA. In 2004, Catholic University of America awarded him the Gibbons Medal for distinguished and meritorious service to the USA. In 2015 he was selected for the Doughboy Award, the highest honor the Chief of Infantry can bestow on any infantryman for outstanding contribution to the United States Army Infantry. Bring your guests to help welcome General McCaffrey and enjoy the presentation given by our distinguished speaker.